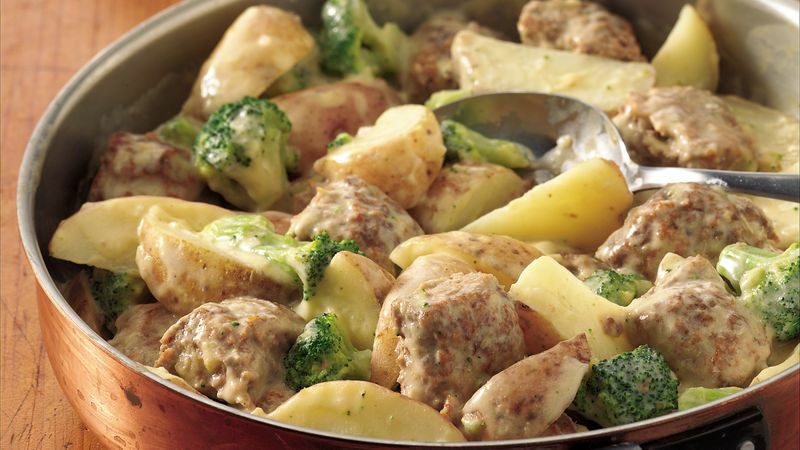 In 12-inch nonstick skillet, combine potatoes, soup and water; stir gently to mix. Bring to a boil. Reduce heat to low; simmer 5 minutes, stirring occasionally. Stir in broccoli and meatballs; simmer 10 to 15 minutes or until broccoli and potatoes are tender, stirring occasionally. Stir in sour cream; cook just until thoroughly heated, stirring occasionally. If your family likes green beans or peas, go ahead and substitute either for the broccoli. Slice up some cantaloupe and honeydew melon to serve with this easy meal. For an even heartier meal, bake Pillsbury® Refrigerated Breadsticks while the dish simmers.